The chapter discusses the nature of the relationship between military expenditure, economic growth, and foreign policy commitments, and the consequences on economic growth of apportioning an increased part of the gross domestic product to the military in developing countries of Ghana and Nigeria within the Economic Community of West Africa during 1986-2016. Military expenditure has generated controversy, especially in developing countries of Africa, as it competes with demands for sustainable growth and development. Applying the Johansen co-integration test and Granger causality, the results show that high growth rates have enabled the two countries to increase military spending, ensure their own domestic security, and fulfill international security commitments in the West African sub-region and internationally, with negative effect in the long-run and positive effect in the short run on economic growth. The lack of defense and military expenditure linkage with the wider economy is the resultant socio-economic cost recorded over the period under study. Governments play an important role in both economic growth and military expenditure. One cannot exist without the other as there is mutuality: national security is a priority for every country to ensure a conducive environment for economic growth. However, military expenditure competes with other demands for public investment including citizens’ welfare, which requires proper balance between military and civilian expenditure; and considers the effects of increased military spending on growth. 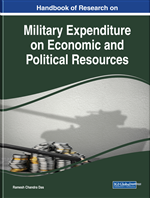 Therefore, this section examines the context critical to understanding the causal relation between Gross Domestic Product (GDP) and military spending, the consequences of military expenditure on growth, and implications for foreign policy objectives and behaviour. The discussion goes further to focus on theoretical arguments about the military expenditure-GDP nexus and its relationship to foreign policy demands. Determinants of high military expenditure and consequences thereof, are explained as well. Empirical literature shall be presented that support theoretical arguments that show variations in the impact by GDP on military expenditure and vice versa, and in some cases emphasize mutuality between the two. The two countries, Nigeria and Ghana, are analyzed to establish the relationship among the three variables of economic growth, military expenditure, and foreign policy goals. We analyze the motivations behind a state’s decision to increase military and defense spending, variations in a country’s Foreign Direct Investment (FDI) within the context of foreign policy goals is to be verified within the hypotheses as set-forth. In general terms, three hypotheses can be deduced about a state’s military expenditure which in turn would be applied to Ghana and Nigeria as follows: There is a positive correlation between a country’s levels of GDP and military expenditure, which in turn, significantly influences its foreign policy framework. To survive as a modern nation-state, a country has to significantly increase its military expenditure to promote its foreign policy goals. States are compelled to significantly spend their scare resources on military expenditure to project power and deflect scrutiny when domestically challenged by sudden conflagrations by internal actors. A sub-regional hegemon or leader has to increase military spending to boost capabilities in response to security demands. Poverty Reduction: Lifting of majority of people from deprived conditions of life. Military Expenditure: Military expenditure is determined by a balance between its opportunity cost and security benefits accruing to the whole state. Development: Is growth and improved living conditions, and structural transformation of the economy from a subsistence agriculture to manufacturing and service based from which the majority of the population derive their livelihood. Foreign Policy: A state’s decisions and strategies that shape actions directed at the achievement of international goals on a range of issues including economic, security, peace, technology, prestige, or status. Gross Domestic Product: Is the monetary value of the total amount of goods and services produced by the national economy annually. Economic Growth: Growth is the increase in output of an economy or number of industries established in an economy.